One of the best and most cosmopolitan restaurants in Barcelona that offers its guests a remarkable Catalan Modern decor along with extremely good Catalan classic cuisine, blended with lighter and innovative molecular cooking techniques. 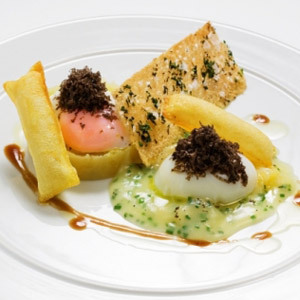 Chef: Carles Tejedor is one of the pioneers of molecular cuisine who started his experimental learning at London’s Savoy. Awards: Among many other awards granted to Carles Tejedor, it is worth naming the 1 Michelin Star award; Best Professional of the Year Prize in 2009; Three Suns by 2012 Repsol Guide; National Gastronomy Award of 1995; Golden Cook Award in 2002 and a special homage rendered to the best Restaurant of the Year by San Sebastian’s Gastronomic Week; Medal for Touristic Merits by the Generalitat de Catalunya.